It is shortsighted, destructive and dangerous to argue that God’s law and intent are violated when couples don’t get along after all. Yet Jesus does just that in Mark 10. He condemns divorce, culminating in the famous verse 9: “Therefore what God has joined together, let no one separate.” Did Jesus really think that it is God who makes all the matches, so many of which are disastrous? In Mark and Luke we do not find the words “except on the ground of unchastity.” Somehow, in a small mercy, Matthew saw fit to add that modification. 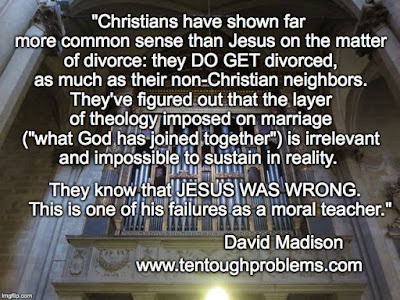 Let it be noted, by the way, Christians have shown far more common sense than Jesus on this matter: They do get divorced, as much as their non-Christian neighbors. They’ve figured out that the layer of theology imposed on marriage (“what God has joined together”), is irrelevant and impossible to sustain in reality. They know that Jesus was wrong. This is one of his failures as a moral teacher. The Catholic Church has maintained a level of rigidity on divorce that defies all logic and compassion—based on Jesus’ bad counsel on the matter. Yet the church has, for money, figured out ways to help couples escape matrimonial bonds. Don’t we all have our favorite stories of shrewd Catholic maneuvering? Mine is about the man who, for enough cash, after more than 20 years of marriage and three children, was able to buy an annulment. The church, it would seem, is not opposed to laying up treasure on earth. 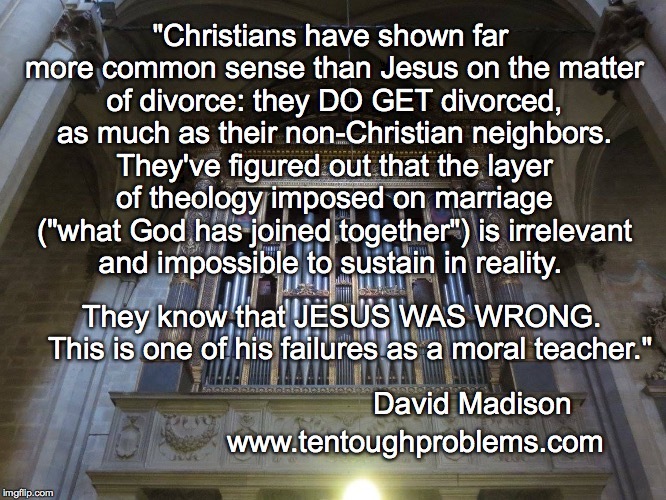 David Madison has a PhD in Biblical Studies from Boston University. He has a PhD in Biblical Studies from Boston University, and was a pastor in the United Methodist Church for nine years. His book, Ten Tough Problems in Christian Thought and Belief: a Minister-Turned-Atheist Shows Why You Should Ditch the Faith, was published by Tellectual Press in August.